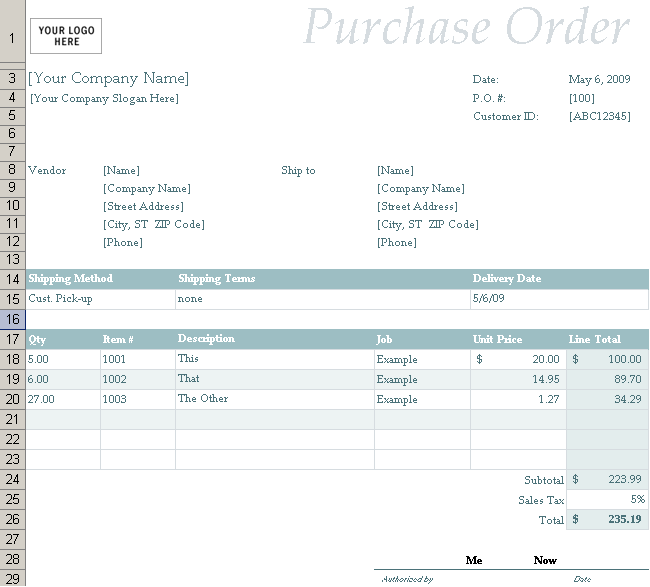 Use a Microsoft Excel Template to easily create a simple Order Form. Or you could keep it low tech and create a virtual shopping list of all the possible items you purchase from a given source, enter the count and amount manually and use a calculator. 1. Taking the low-tech approach can serve you well, if nothing more than to act as a backup option. Compile the information, from various recent receipts, and enter it into a simple text document. Once satisfied you have covered every item in that category, print a dozen or so. Keep in mind that you may need to create versions for other categories as well. For example, a Gutter & Downspout business would need them for different sizes, different shapes and metals such as copper, aluminum and galvanized steel. 2. Use Excel Template 10100133.XLT (from Microsoft.com), provided you have Microsoft Office. This type of document allows you to enter quite a bit of information, including your own Company Name & Logo. Embedded Java script allows it to automatically multiply the Unit price by the Quantity to give each line total. Once you have completed adding to your order, the Subtotal reflects the pre tax amount. Enter the applicable sales tax % and the Total automatically tabulates the sum. 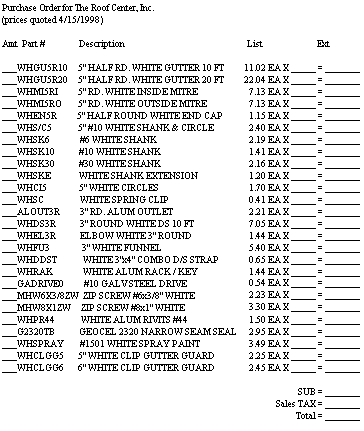 For repeat orders, you can leave the Quantity blank and save the document as 5" K Aluminum, for example. This allows you to save one in each category required. Once you have saved a template in each category, right-click on the closed file, go into properties changing it to 'read only' to protect it from accidental alteration or deletion. The program will prompt you to give each new save a different name. The Job name is a good choice! 3. Verify current prices at regular intervals, no matter which type of document you decide to create. Check with your suppliers to find out when they normally update their pricing. Availability, changes in Taxes and Shipping costs, etc., often influence price fluctuations. * With 'low tech' printed Order Forms, you can easily figure Materials & Taxes, add your Labor and write Estimates on-site, without the expense of a Laptop Computer & portable Printer. While the Hardware & Software may be deductible, it can break down and fail at the most inconvenient time.